The former professional golfer established Ossian to introduce luxury travelers to the endless allure of Scotland. What do you do when you retire in your thirties? Start something you're passionate about, of course. That's exactly what Ted Innes Ker—a name golf fans and royal follwers are sure to recognise—did when he retired from his professional golfing career and moved back home to Scotland. 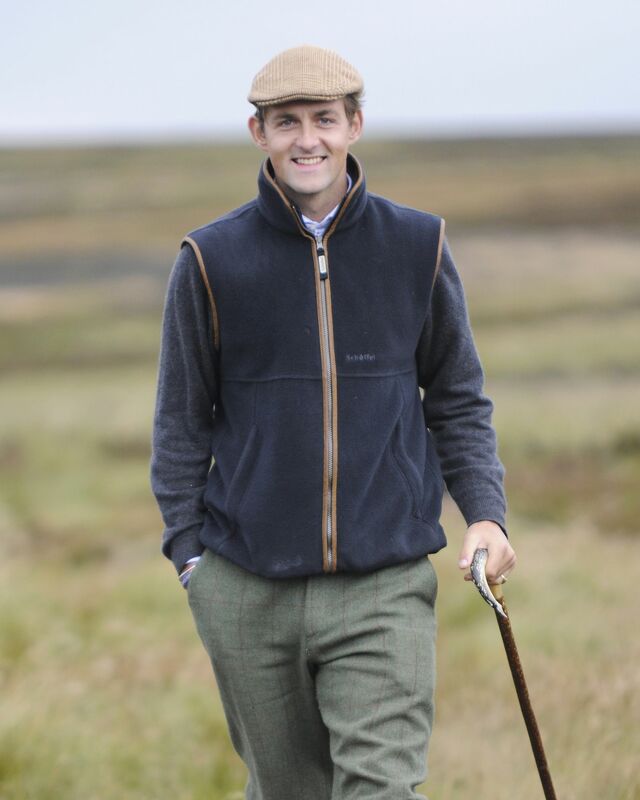 The son of the Duke of Roxburghe (Innes Ker is officially a Lord) established Ossian in 2017, which offers tailored luxury travel experiences in Scotland focused on extraordinary adventures. "I realised that there was no company specialising in bringing luxury travelers into Scotland. With the access I have to exclusive properties and experiences around the country combined with the wealth of knowledge and expertise of our parent company Galbraith, we know Scotland like the back of our hand," shares Innes Ker. It's not only the exclusive access that makes Ossian exceptional. It is their ability—and commitment—to turn any request into reality. "We never want to say no to any of our clients, no matter how crazy the request. With the list of contacts that no other agency in the world has, we can provide them with holidays that go far beyond what was previously available," he shares. From opening a private castle for a special dinner to an intimate round of golf at a special green, Ossian offers the very best of Scotland. Being a former professional golfer, it's not surprising that golf is one of their specialities. "Golf has, and always will be an enormous part of my life. It also helps that Scotland is the birth place of the great game, and millions of people come here to play many of our great courses. Over the five years of my professional career I lived and breathed it so I can provide expert tuition (and some fairly colourful stories!). Aside from that, I am able to open doors to the most private courses so that our clients can not only play the likes of the Old Course, Carnoustie, and Turnberry, but also the private members clubs and hidden gems dotted around the country." And while Scotland is commonly associated to warming whisky, lush highlands, and the recepient of a fair bit of rain, Innes Ker stresses that there's more to what meets the eye. "A lot of people think it only ever rains here. While this is true at times (much like the rest of the UK), there is no better place to be when the sun is shining than in Scotland. The west coast was voted the world’s best sailing location in 2016, and out of everywhere in the UK, Inverness has the best climate to learn to fly. In April 2017, Edinburgh was the driest place on the British Isles, so it can’t be all that bad… Hopefully Ossian’s adventurous trips will help to debunk that myth." Ted Innes Ker (TIK)My last trip was spent fishing the River Alta in northern Norway. It is the finest Atlantic salmon fishing experience in the world and my family have had an association with the river since the 1860s. To get to the camp, it takes at least half an hour in the Alta riverboats from the nearest road, and there is no phone signal or wifi once you get there. This ensures an experience that is totally private, uninterrupted by the outside world and the fishing is truly incredible. The average size of fish is 24lbs and every week of the season there are 40lbs+ fish caught on the river. The lodge is extremely comfortable and the food is some of the best I have ever had. My father is lucky enough to have caught two salmon over 50lbs, and my grandfather caught a 51lbs salmon and a 53lbs salmon in the same day! My record? A mere 44lbs… so far! TIK I'm off to New York, Dallas, Houston and LA—I'm hoping to play some pretty serious golf courses during that trip. TIK Definitely meeting a wide variety of people, seeing new and stunning places, and experiencing new things. With my golf career I was travelling to a new country almost every week so now I am based in one country most of the time, I love getting out and about in my car and seeing the different parts of Scotland and the wider world. TIK When I was 19 I went down to New Zealand to work on a fishing lodge in the South Island. When I had some time off, I was lucky enough to fly into a river system not reachable by anything other than helicopter. Myself and two friends spent three nights up staying in a bothy, fishing for huge wild brown trout, and being completely immersed in nature. Every day we came across enormous red stags who seemed to be inquisitive rather than scared of us—it was an awesome experience. TIK The Nepalese roads and the drivers on them. Never before have I been so scared! It was a toss up to go to Pokhara either by road or plane. I chose road but I think next time it would have to be plane, at least that takes under an hour compared to the roads which took 8 hours of pure bouncy terror! TIK That is a very tricky one to answer because there is any number of places I'd love to revisit again. If I had to pick one, it would be the very northwest tip of Scotland. It is utterly beautiful—very rugged, has miles upon miles of white sandy beaches and aquamarine blue sea. As soon as you gain any height from the coast, you can see even over to the stunning Isle of Lewis. When the weather is good, there is no better place to be. TIK My golf clubs, a fishing rod, and binoculars. TIK Once I work through a car or a golf magazine, I tend to read something easy like Clive Cussler or Simon Scarrow. Not too heavy and quick to get through. TIK It would have been my Labrador but sadly he passed away a couple of years ago. So in the absence of my old lab, it would be my golf clubs. They come everywhere with me. Up mountains, on beaches, and of course, all the amazing golf courses I have been lucky enough to play. TIK Window. I have always been found looking out the window my whole life. Something that my teachers at school constantly struggled with! TIK Vamoos is brilliant! In the day of the mighty mobile telephones, it is the best app around. TIK Try to be as open-minded as possible. One of my favourite family holidays was a week in Mallorca where the travel agent stitched us right up with a villa that at first looked incredible, but on arrival we realised there had been a lot of artistic licensing used on the photos. However we totally embraced it, and made the most of the holiday. I honestly can say it wouldn’t have been as much fun as if we had had the amazing villa, as we got out and experienced the quirky, quaint and beautiful side to the north of the island. Can you share a useful (and unique) Scottish expression? Create an unforgettable trip to Scotland with the ultimate insiders at Ossian.